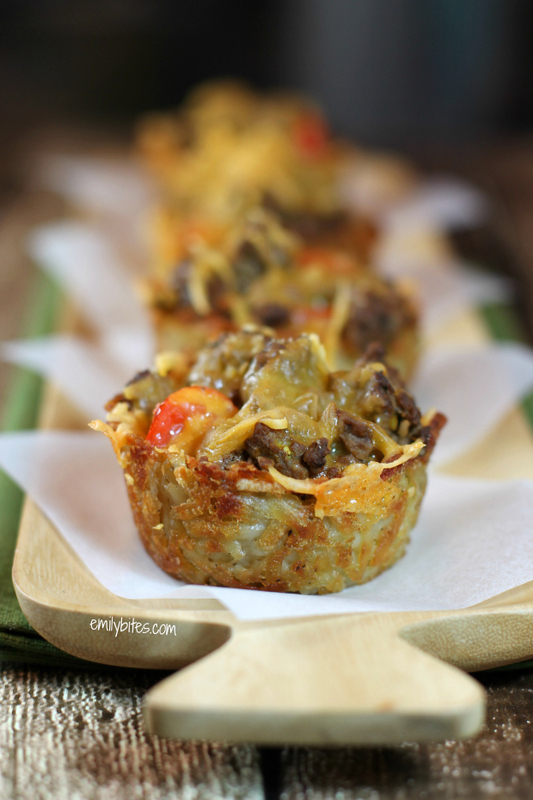 These Cheeseburger Hash Brown Cups are like a cheeseburger and French fries all in one! If you think those two make a good team when side-by-side, just wait until you try them together. Yum! The hash browns form a perfect cup that’s crispy on the outside and soft and potato-ey on the inside. Each cup is then piled high with seasoned ground beef, ketchup, mustard and tomatoes and topped with melty cheddar cheese. Sound sinful? One of these tasty and filling cups weighs in at a mere 131 calories and only 3 Weight Watchers SmartPoints. It’s true! I eat two cups as a main course and serve them with some veggies on the side for a complete meal. It’s super filling and takes care of any fast food cravings in one fell swoop! Pre-heat the oven to 375. Thoroughly mist 12 cups in a standard muffin tin with cooking spray and set aside. Place the shredded potatoes in a large mixing bowl and drizzle with the olive oil. Add the salt and black pepper and stir to coat. Divide the coated potatoes into the prepared muffin cups and press the hash browns down and up the sides of the cups to form a well in each. Place in the oven and bake for 35 minutes. While the cups are baking, mist the bottom of a large skillet with cooking spray and cook the onions over medium heat for a few minutes until softened. Add the ground beef and hamburger seasoning and cook, breaking up the meat with a spoon until browned. Transfer the meat and onions to a bowl and add the ketchup, mustard and chopped tomatoes. Stir to combine. 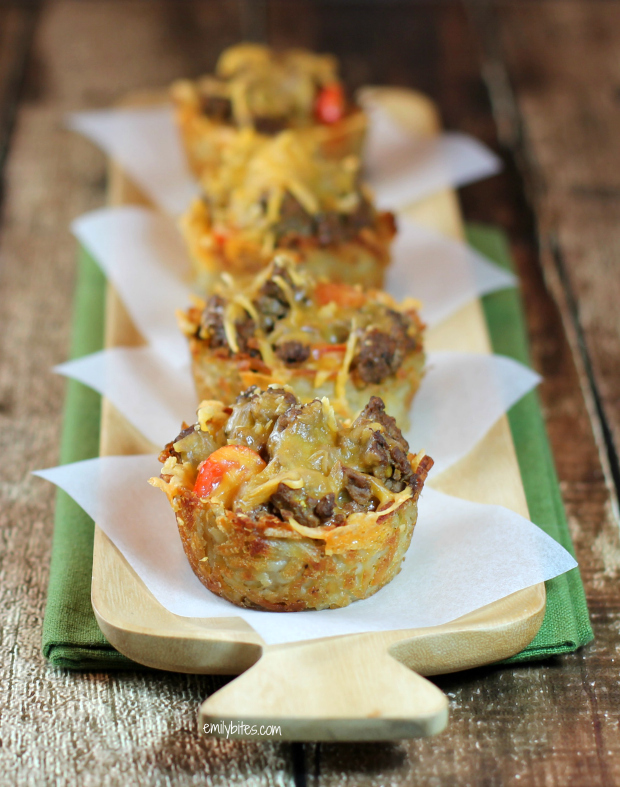 When the hash brown cups are ready, remove from the oven and divide the meat mixture evenly amongst the cups. Sprinkle the shredded cheddar over the piled meat in the cups and return the pan to the oven for an additional 10-15 minutes until cheese is melted and hash browns are golden brown. Allow to cool for five minutes, remove from pan and serve. I am thinking that I could probably substitute riced cauliflower instead of the potatoes for a base and it would probably be as good. I have to try this. I would leave the ketchup out, and add diced dill pickles and onion. Just my preference. 🙂 Sounds yummy! Emily, we LOVE all of the recipes that we’ve tried so far, I’ve tweaked a few things here and there to fit my family’s likes (they can be picky!). All of the cupcakes have become staples in our menus. Can’t wait to try this one! my hash browns didn’t really crisp up either…maybe should have sprayed the tops with cooking spray halfway through? I was eating everything all during the prep…so good! and DEFINITELY add chopped pickles along with the chopped tomatoes…makes the dish! Emily these are great! I love the tasty recipes on your site. They don’t dirty every pan and bowl in the house and they are affordable! I have been to other blog recipe sites where I have to use 3-4 pans and all burners and 2-3 mixing bowls in the same recipe (plus forever in prep and cook time, at least an hour standing there). I’d have given up on WW if it wasn’t for your site! Keep ’em coming! A thousand thanks for this recipe Emily! The muffins were delicious, and both my husband and daughter (notorious picky eaters!) love them. We will definitely be making them again! Made these for dinner exactly as the recipe states – yummy! Will definitely be making these again! These fell apart on me…might try using some egg whites to help bind them together next time! Emily, I made these tonight for my family and they were yummy! I had never purchased the Simply Potatoes before, or the McCormick’s Hamburger Seasoning either, but they worked out well. The only change I made was to use full fat cheese, since that’s what I had on hand. Will definitely make these again. Thanks for a great recipe! But this was SOOO good. My husband and our roommate are picky eaters (roomie hates tomatoes!) and they LOVED these. Roomie even pointed out tomatoes and then took another bite. These are awesome, and if you’re using cupcakes pans like me (don’t have any muffin tins) then it pretty much doubled the amount. So instead of 12 muffins you have 24. Trying the buffalo chicken bites tomorrow night! So happy they were a hit, even with the picky eater in the bunch 🙂 Hope you love the Buffalo chicken bites as well! PS – I just use standard size muffin/cupcake tins, so if that’s what you’re using they should work out to be the same size! made these tonight and they were yummy!! My potatoes crisped up just fine and they were easy to get out of the muffin tin, too. The family loved it!! Thanks for a great recipe! Hashbrowns were crisp and everything was very tasty. They are very filling and will definately make again. These were good, but they fell apart. Have to try again and see what went wrong. I didn’t use the mustard because my husband doesn’t like it so that may have been the problem. Thought I put enough ketchup in to balance it, but I guess not. The potatoes fell apart too, but held together the next day. They tasted good, though. I have ground turkey that I need to use up! Do you think if I used ground turkey instead of the ground beef it would still taste good? The hash browns didn’t get very brown for me either, still really good though!! Next time I may sautée them a little beforehand to make sure they get more brown. These were delicious, but mine completely fell apart as well! For anyone making these, the potatoes definitely shrink down quite a bit, which is why I think mine fell apart. Also, they crisp up a bit more if you spray the tops of them as well with some cooking spray. Also added chopped pickles in with the tomatoes which were a nice addition. Excellent. Thanks again Emily! These were GREAT. I’ve added them to the list of things to make again! Mine crisped up just fine and didn’t fall apart- perhaps people aren’t pressing them against the sides of the cups with enough force? I will try a little pickle next time as well, thanks for another fantastic recipe Emily! Just started WW this week and this is the second recipe we have tried. Made exactly as posted and it turned out great! Yes, they kind of fall apart a little and the little wells in the ‘cup’ were not perfect, but the taste and texture WERE! Love! I made these last night, along with your French Dip Wonton Cupcakes. HUGE HIT!!!! Both were delicious and no one could believe I ate them on Weight Watchers. You’re the BEST! Emily (or others that had success with crispy hash browns) – any advice for making sure they don’t fall apart? Could it be just leave them to bake a little longer until they are a nice brown before adding the filling? I cannot wait to try this. You never let me down! I made this for dinner tonight as written, and it was delicious! I used Simply Potatos and had no issue with them falling apart. My tall, thin husband ate 5 of them for supper. I restrained myself at 2. Thanks for another healthy recipe that anyone, WW or not, can appreciate. I am not sure if I am doing something wrong but when I put the nutritional facts into my WW app, it says they are 4 SP per cup. Anyone else having this issue?? Hi Katie, maybe this response from my site FAQs will help? I ran the nutrition information you posted through my points calculator and it doesn’t match the SmartPoints value you listed for the recipe – which one is right? One of the changes Weight Watchers made in the switch to SmartPoints is that the recipe builder no longer counts the values of 0 SP fruits and vegetables when determining the final SP value for a recipe. Therefore, the SPs you get from the recipe builder may not match the SPs you get from running the nutrition information through the Weight Watchers SP calculator, because the nutrition information will contain the calories, etc from the fruits and vegetables. Added Green Olives to Mine! Yummy! this sounds so amazing and i am definitely going to make it asap! I am confused with the smart points. how do I enter them correctly in my WW app. I tried the recipe builder and it says they are 5 smart points? I didn’t see the sodium content of this recipe listed made as is. Can anybody make an educated guess? That is my only concern – other than that, they sound delicious! If you’re in need of any nutrition info I haven’t listed, you can definitely calculate it yourself using the recipe calculator on myfitnesspal! I originally made this as-written awhile ago and thought it was just ok. But then last night, we tried to again but in a 9 x13 pan (like the Cajun beef hash brown bake) and it turned out so good! We added the mustard, ketchup and pickle after because I didn’t want those warm and used Laura’s lean 96% beef and Cabot light cheddar so we could have bigger portions (with a ton of cheese) for a similar points amount. My husband asked for us to make it on a weekly basis! Thanks for all the great recipe ideas! I was reading the comments…..I was contemplating using cupcake paper cups….I think I will since quite a few said theirs fell apart. we’ll see how it works. I am omitting the grape tomatoes and adding center cut bacon and mushrooms so it’s 4sp, but I think my son and I will enjoy. These were so tasty – Again the family loved them – Recipe is a keeper. Thank your for you easy and delicious recipes. GO WEIGHT WATCHERS! !